"The driving force of capitalism is the attainment of increasing rates of surplus value. This is inevitably exploitative and demeaning of the human condition. This makes an increased awareness of ethics in business practise untenable. Discuss." Seen in its entirety, this is quite a bold statement, and a challenge. I want to face this challenge and bring light into the notions, the links between these notions, and the overlapping areas. But I do not want to risk a "false start". So, before I get started I want to draw a map on how I will approach this topic. The statement comprises of three arguments, or, more specifically, one argument and two consequences. They consist of the type argument 'if A then B' and 'if A and B then C'. In addition there is the request to 'discuss' in the statement. 'Discuss' could only apply to 'C'. In this case 'A' and 'B' would be taken for granted. I cannot easily accept this so I apply 'discuss' to 'A', 'B' and finally 'C' and approach each phrase separately. So I can reveal that 'if A and B then C' is only true under prior assumptions made about 'A' and 'B'. Chapter A deals with 'A', capitalism. Here I will provide a definition of capitalism containing its characteristics and effects and arrive at the answer as to whether "increasing rates of surplus value" are the "driving force of capitalism". 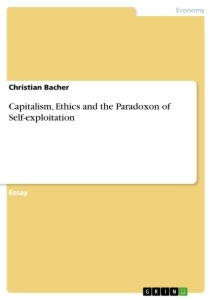 Chapter B shall examine whether capitalism "is inevitably exploitative and demeaning to the human condition". But before the terms 'exploitation', 'demeaning' and 'human condition’ are discussed, they need to be defined. This chapter contains an analysis how 'capitalism' and 'humans' interact and interfere each other. Chapter C works on 'untenable (business) ethics'. Ethics, business ethics and their significance for 'humans' and 'capitalism' are presented. The focus here will be on the overlapping areas of 'ethics' with the contents of the other two chapters. The chapter concludes with conditions that fulfil the statement 'if A and B then C', with arguments discussed in light of the essay statement. But, actually, things are not that easy. The path of argumentation is relatively thin and unsatisfying. That is why the 'findings' section at the end of this essay questions the facts 'if A and B then C'. There are some underlying assumptions that this statement is built on. I will uncover some of these 'granted facts' and try to go one step back. The then broader but also deeper insight into the notions of 'rationality', ‘bureaucracy’ and 'ideology' also mark the turn to my self-reflective essay. Capitalism is a "type of economic organisation" (Lash & Urry, 2000, 36) or an "economic system" (De George, 1986, 104). It describes "ways in which people are related", particularly those relations that "are mediated by money and commodities, by prices and wages, by supply and demand" (De George, 1986, 111). Systems contain structures in the form of rules, that people, as players within the system, rely on. As such, it shapes people's lives. An economic system, taken out of its societal context, described separately, and formed into an abstraction to get a better insight into its functioning and rules, is still just a model. It does not reflect the functioning of the existing society completely (De George, 1986). Three basic features are held to be essential to capitalism: available accumulation of industrial capital, private ownership of the means of production and a free market system (De George, 1986). Industrial capital is the basic means, the wealth or money to purchase, build or transform means of production in order to create goods and services. The notion of capital as productive input into production can be expanded to other resources, like land, raw materials, labour and knowledge. The accumulation of these input factors is not a specific characteristic of capitalism but of every modern society (De George, 1986). Private ownership, however, is one. Private ownership relates to all the resources for the production process, both as inputs (like raw materials) and means of production (like plants and factories). Private property - owned by the individual or a group of individuals - guarantees that the outcomes, out of the productive use of the property, is allocated to the owner of the resource, too. The free market seems to be the most extensive of the three basic elements of capitalism. What is it? A market is basically a 'platform' or place where demand and supply meet, where goods are exchanged for mutual benefit. 'Free' in this regard means that people freely conduct these exchanges, free from interference and coercion by a third party, i.e. by the state or by monopolies. 'Free' also means freedom of access to the market, freedom of choice of the contract partner and freedom of transaction. The exchange is also the situation where private ownership and capital accumulation links in. Exchanges would not occur if a market player could not transfer the proprietorship of a particular good to another. Moreover, a player would and could not accumulate capital if he, as an individual, did not place a higher value on a resource than his contract partner, who sells it. This latter concept of the interest in personal gain from a transaction was described by Adam Smith (1723-1790): "It is not from the benevolence of the butcher, the brewer, or the baker, that we expect our dinner, but from their regard to their own interest. We address ourselves, not to their humanity but to their self-love [...]" (Smith, 1776, vol. I, 13). Smith observed this, self-interest of the individual as interest in personal material betterment, which was considered as the driving force of capitalism in later economic theories. Smith's observation about the individual's motivation was further developed to another model, the model of economic man. The economic man is characterised by being solely self-interested, not emotionally bound or related to other humans, using success-oriented rationality by maximising his expected utility under existing conditions (Düwell, Hübenthal & Werner, 2002; Homann & Blome-Drees, 1992). It is then assumed that the utility is positively correlated with the amounts of obtained goods or gained profits. Goods, as the 'means representing utility' for the consumers, are scarce and costly. To maximise utility people buy the goods for the lowest available price. That leads consumers to the supplier that offers this price, the 'best deal', or the best value. On the other side, the utility (normally profit) of this particular producer is maximised, too, if he is maximising his profit margin through cost cutting. However, the free market is not a static system. Instead, it is operated by a dynamic market mechanism, which includes competition, freely moving prices, and unpredictably, quickly changing consumer interests and occurring innovations. Other producers observe the increasing profit chances and see their own opportunities to attract the customer's money. They become either more efficient, or generate innovations that match consumer needs better. But the company that has the competence-advantage will have it just for a short time until it diffuses to its competitors. Increasing profits attract new competitors, which intensifies this persistent 'race'. Moreover, if players lack personal, time and place-related preferences, are indefinitely mobile and adopt new price and product information, indefinitely quick the model of the so-called perfect market is complete. The opposing market forces, represented by the aggregated consumer and producer interest act, in Smith's words, like an 'invisible hand' allocating resources in those uses and purposes that promise the highest utility, thereby maximising competition and efficiency rates (Fritsch, Wein & Ewers, 2003). One way to increase efficiency is the division of labour. "Manufacturers found that they could subdivide complex tasks into simpler ones and could then speed along these simpler tasks by providing their operatives with machinery" (Encyclopaedia Britannica, 2005). This increases output and reduces costs simultaneously. Wages drop because simpler tasks can be done by lower skilled workers who reflect 'cheaper' labour at the labour market. Specialisation, however, also requires highly trained and skilled labour to perform responsible and demanding tasks within a particular production process. Instead, by lowering wages the wealth of the capitalist is then maximised by the improved product characteristics and, hence, demand for the product. Wealth and its amassing is a crucial issue in the capitalistic reality: "[T]he driving need to extract wealth from the productive activities of society in the form of capital [...] [is] the single most important element in capitalism" (Heilbroner, 1985, 33). Wealth is not surplus. Surplus, which "refers to the difference between the volume of production needed to maintain the workforce and the volume of production the work force produces" (Heilbroner, 1985, 33), is not a particular characteristic of capitalism but a concept of the evolution of every society. Surplus as the "margin over and above that required for the maintenance - the "reproduction" - of society" (Heilbroner, 1985, 33 ) enables a society and its members to afford the desired objects, necessary for improving individual and collective quality of life. Wealth, here, as surplus, has an inherent "use value" (Heilbroner, 1985, 34) which means it is finally transformed into a 'means of utility' and nothing else. But "the use of wealth [in capitalism is] not as an end in itself, but as a means for gathering more wealth" (Heilbroner, 1985, 35). The drive to amass wealth might be considered as an expression of greed at the level of the individual person. However, within the systematic realm of corporations that face competition, it is a logic result of capitalism. This is because, in the perfect market, the only competitors to 'survive' are those that accumulate the highest profit and immediately reinvest it to accumulate an even higher profit, in order to maintain those levels of innovation, efficiency, and “best value” that the market demands. Hence, the driving force behind capitalism is the "continuous transformation of capital-as-money into capital-as-commodities, followed by a retransformation of capital-as-commodities into capital-as-more-money." (Heilbroner, 1985, 36). Capitalism is therefore a form of economic activity using material things as moments in the capital's continuously dynamic and evolving existence (Heilbroner, 1985; Lash & Urry, 2000). According to the finding of this chapter the initial argument can be verified: Yes, the driving force of capitalism is the attainment of increasing rates of surplus value. Lastly, the role of the political system that interferes with the economic system of capitalism shall be described briefly. De George notes that "capitalism is always found embedded in some cultural and political setting" (De George, 1986, 116). Indeed, the relationships between capitalism and a certain form of politics seem loose enough to allow different sets of business-government relations. De George identifies six of them (De George, 1986), ranging from a laissez-faire, libertarian culture, over protectionism to capitalism-constraining policies. Each society develops its own idea of what is regarded as 'right' and 'wrong' among the notions of freedom, distribution of wealth, social welfare, economic growth etc. However, the functioning of capitalism as described above depends on certain policies and governmental infrastructures, because of at least two reasons. Firstly, enforceable property rights need to be guaranteed to legal entities, individuals and corporations. If not, transactions and exchanges would be made impossible. Secondly, the market players have an interest in limiting 'existence-threatening' competition by establishing price agreements, cartels or monopolies in order to set prices far above the marginal costs. Corporations as suppliers or producers are more likely to achieve such agreement than the consumers on the demand side. This not only increases profits at the (over-proportional) expenses of these consumers but also slows down the speed of innovation - a development which is generally not appreciated by political decision-makers. Anti-trust regulation is consequently a measure to safeguard the unlimited unfolding of the market forces. Much has already been said or implied about human beings in the outline of capitalism. Humans act as market players. They are either owners of the means of production, respectively represent the capitalists. Alternatively, they represent the employees in corporations and workers in a factory. It is assumed that all human agents in capitalism are economic men, pursuing only their own self-interested purposes. It is further assumed that this self-interest is connected solely to one's material betterment and improvement of the quality of one's life by maximising one's utility which is represented by the 'pile' of goods one possesses. Before I begin a further examination of the interrelation of 'humans' and 'capitalism', the notions that dominate ‘B’, the second argument, - "This [the attainment of increasing rates of surplus value] is inevitably exploitative and demeaning of the human condition." - need to be clarified. The notion of human condition is difficult to grasp. It can be described as the"personal being in the world" (Gusdorf & Tiles, 2005) or "a term which encompasses the totality of the experience of being human and living human lives. As mortal entities, there are a series of biologically determined events, like sleep, eat, reproduce or periods like birth, childhood, adulthood, aging and death which are common to most human lives, and the way humans react to or cope with these events is the human condition" (Wikipedia, 2005a). Human condition is also about human nature and the self-awareness of human beings about these 'events' and the alteration and improvement of these events (Wikipedia, 2005a). Apart from these events, what can be commonly said about human beings ? Human beings are "social animals" (Singer, 2005), as living in groups is a typical characteristic of the human species. From small to large, these groups include family, kinship, tribes and communities, up to societies, nations and even civilisations. "Each individual is a given determinate form by the environment in which he is born, brought up and lives" (Gusdorf & Tiles, 2005). People can be proud, sensitive, eager for recognition or admiration, often ambitious, hopeful or despondent, and selfish or capable of self-sacrifice, to name just a few traits that an individual could adopt (Gusdorf & Tiles, 2005). "They take satisfaction in their achievements, have within them something called a conscience, and are loyal or disloyal" (Gusdorf & Tiles, 2005). In difference to all other animals, human beings have the ability of reason, self-awareness and self-consciousness, and the freedom to exercise their will (Ritter & Gründer, 1980a; Singer, 2005). Theories of 'human needs' say that humans have 'needs' deriving from the subjective experience of physical and emotional deficiency (Ritter, 1980). Therefore, each individual during his life develops and finally attains an idea of what pleasure, self-fulfilment, self-satisfaction or happiness means to him in order to resolve the condition of deficiency. In view of this goal, man develops a 'life-plan' to lead a 'happy life'. Another concept that can be related to 'human life' is that of 'human dignity'. Dignity represents an intrinsic value of the human being grounded on his ability to reason, an ability that other animals do not possess (Ritter & Gründer, 1980b). Acknowledging this value means acknowledging certain rights to the individual, written down for example in the United Nation's Universal Declaration of Human Rights (United Nations, 1948; Ritter & Gründer, 1980b). Rights relevant here include the right to life (Art.3), the right to work (Art.23) the right to "a standard of living adequate to health and wellbeing of [oneself] and [one's] family" (Art.25), and the right to "free and full development of [one's] personality (Art.29) (United Nations, 1948, italics my own). Demeaning means “to lower in condition, status, reputation or character” but can also be used reflectively as “to lower or humble oneself” (Simpson & Weiner, 1989, 433). In this essay ‘demeaning’ is similarly used to describe the lowering and deliberate devaluation of the human condition. While 'demeaning' says nothing about which conditions bring about the deterioration of the human condition exploitation requires an exploiting agent as well as an exploited one. Exploitation can have (at least) two definitions: (a) "the value-neutral synonym for use" and (b) "the negative concept of unfairly using of another for one's own advantage/abusing them" (Wikipedia, 2005b). Both concepts can be applied to the capitalistic model. The former would mean that free agents agree about a service or good that is provided by one and received (or exploited) by the other. A free market system allows such (free) agreements. The latter requires at first a definition of "unfairly". Broadly speaking, one could say that every treatment of a person deviating from what is 'commonly' held to be appropriately just or ethical, (using the example in the form of the above mentioned Human Rights), is unfair. Assuming that the 'deliberate lowering of the human condition of one individual by another individual' is regarded as unjust, does capitalism "inevitably" lead to it? Marx would strongly agree to this theory. In regard to the economic realm, he observed a 'class society' consisting of the bourgeoisie, the capitalists or owners of the means of production and the proletariat, the employees or factory-workers. Both classes differ in their access to resources and their (opposing) interests about the price of the input-resource 'labour'; the worker wants to maximize his wage whereas the capitalist wants to minimise input-costs. Labour division, as described above, helps the capitalist to maximise his 'surplus value' and thereby deprive workers of their 'fair share' of income, "[t]he worker becomes an ever cheaper commodity the more goods he creates (Marx, 1963, 133-134; Marx, 1844). But as well as the monetary 'loss', the altered relation of the worker to his fundamental natural capacity, labour power, was also a concern for Marx. The 'capitalistic mode of production' requires workers to 'sell' their labour (instead of a product) at the (labour) market. Labour "produces itself and the worker as a commodity" (Marx, 1963, 134). For Marx, labour is inseparable to human (well-)being and mental balance, it is the individuals "capacity to transform the world" (Marx, 1963) into a more appreciated state. Furthermore, the worker gains satisfaction through the process of transformation, the involved relationships to other individuals and the inherent contribution of the worker to his society. Giving up ownership of one's labour leads to alienation from one's own nature, from the product of his labour, and from other human beings - "a spiritual loss" (Marx, 1963). "For labour, life activity, productive life, now appear to man only as means for the satisfaction of a need, the need to maintain his physical existence" (Marx, 1963, 135). And like the price on the labour market that the capitalist pays as a means to maintain the worker's physical existence, the worker becomes a means for the capitalist to maximise his wealth. 'A' refers to "The driving force of capitalism is the attainment of increasing rates of surplus value", 'B' refers to "This is inevitably exploitative and demeaning of the human condition" and 'C' equals "This makes and increased awareness of ethics in business practise untenable". 'If X then Y' means: If X is a correct and valid statement or assumption then must Y also be a valid and true consequence. The topic of the self-reflective essay is "A desired strength of management is said to be reflexivity or the ability to be self-reflective. Given what you know about paradigms, modernism, post-modernism/post-structuralism and other issues developed on the course, discuss (a) your own perspective on management and the extent to which, through self reflection, it may have changed over this course, and (b) the possible consequences of this for your future." For this essay the term 'goods' includes 'services' as well. For example the owner of a coalmine may value the money he gets in return for the coal higher than the mere possession of the coal and making no use of it. I assume here that individuals that act as a collective, like an organisation, are still a collective of human beings. So I make no difference between the individual and the collective human being, although this difference might be important for the analysis of organisational behaviour. One example would be that people are forced to provide a certain service or good, which contradicts free agreements and equals slavery. Another example would be that the remuneration or the service in return does not reflect the 'just' value of a previously provided service or good. Zu Joyce Appleby: "Capitalism and a New Social Order"